March is Women’s History Month in the United States, and few professions have historically been as closely associated with women as nursing. Update, April 11, 2019: I made a significant error in the initial version of this post. When I first searched online for information related to the Montefiore Hospital School of Nursing, the only results I saw were connected to the school of that name in Mount Vernon, New York. At the time, I decided not to look for information about the individual nurses, thinking I might do that later. A few days ago I Googled the principal of the school, identified on the photo as M.H. Shellenberger, and was surprised to discover that she worked at the Montefiore Hospital School of Nursing in Pittsburgh, Pennsylvania. You can read about the history of the hospital here and here. In 1990 it was incorporated into the University of Pittsburgh Medical Center, which is why Google didn’t show me any recent results for it. I accepted the first information I saw because it seemed reasonable. I should have confirmed it! Source: The Pittsburgh Press (May 18, 1938). Page last updated April 12, 2019. A very determined and dedicated group of ladies! Haha, you’re probably right! I imagine the work was very similar to today in some ways and very different in others. A tough profession, no doubt! They do look determined and were probably grateful that they would be employed in 1938. I remember when nurses dressed like that. What would they think today if they knew there were women doctors? And men can be nurses? We have come a long way! I like the way you cropped the photos to give us a close up with a name. Cheers for women! I’ve never seen statistics about men in nursing, but the number of women doctors has fluctuated a great deal over the past 150 years. The 1890s were a high point, and then standardization of curricula at medical schools meant that fewer programs were designed specifically with women’s health in mind, so the number of women earning medical degrees declined dramatically in the early decades of the 20th century. It was the opposite of progress! Their uniforms look a bit impractical and make them seem a bit unapproachable – they are so stiff looking. True. I suppose the goal was professionalism as well as practicality. I know this is showing my age, but I remember the first time I saw a nurse wearing scrubs. My immediate reaction was, I’m supposed to trust my physical well-being to someone who comes to work in her pajamas?! People of helping professions often dedicate their whole life to their work, and after the death a few people remember about them. Thank you for writing their names. What a nice comment, Alena. I think people in helping professions are remembered forever by the people they help, even if the helpers don’t know it. I wish to believe in it! Thank you, Brad! Thank you so much, Suzanne! I wonder how many lives these young woman touched during the course of their careers. It would be interesting to know where fate took them and whether or not they went overseas. I haven’t tried to find any of them in census records. With only an initial instead of a first name, it might be difficult or impossible. Still, it might be worth a try. Their skills would have been in great demand in the coming years. It is a heartening thing to see how long lived are our institutions and how much discipline and work it has taken and takes to create and sustain them. Big important ones and smaller ones. The Montefiore Nursing School still there and still adapting, no doubt. Very heartening at this time in the history of our nation! Only the principal wears white shoes and white stockings. Different outfit altogether, of course: long sleeves, buttons and what appears to be a coat dress. Perhaps this is still the case? So coded an environment that the briefest glance told you who was who. Silicon Valley popped into my mind and I began to laugh….Although I have no doubt that they, too, have their coded signifiers of rank and authority! Sarah, I’ve just updated this post. It turns out they were in Pittsburgh! What an interesting time to become a nurse – right before WWII. A previous commenter said they liked how you showed each woman individually, with their name, and I agree. It makes a person curious to know what happened to each of them. I agree, it would be interesting to know about their future, and also about their past. Were they all born in the United States, or did some of them arrive as children in the wave of immigration from Europe after the First World War? Maybe one of their descendants will find this page and let us know (I hope!). Does anyone else remember the Sue Barton novels by Helen Dore Boylston? They had some of them at the local library when I was a child (translated into German), and I loved them! “Sue Barton, Student Nurse” came out in 1936. I don’t remember where the training hospital is supposed to be, but “Sue Barton, Visiting Nurse” is set in New York. How fun! I hadn’t heard of the books or the author. Apparently the setting for Sue Barton’s training was the Henry Street Settlement in lower Manhattan, founded in 1893 by Lillian Wald. Montefiore School of Nursing (New York) was founded in 1901 as part of Montefiore Hospital (founded 1884). So, the nursing schools were getting started around the same time. The history of medicine and medical care would be a great subject for a blog! How about the nurse Cherry Ames series? I started reading these books in the sixth grade and then abandoned them when I realized they were written to a formula. Oh, I never heard of them! I think a lot of the books I read followed the “girl gets a pony” formula. I just mentioned Cherry Ames in a comment. I enjoyed them. I remember them! Between Sue Barton and Cherry Ames, I never knew which to read first. They were great books, and if I didn’t have the whole set, I had close to it. Of course, I read the Bobbsey Twins books, too. I’m old enough to remember those early copies, with the great covers and artwork. I think I probably discovered the Cherry Ames books at the wrong time in my reading trajectory. I’m glad you enjoyed them! 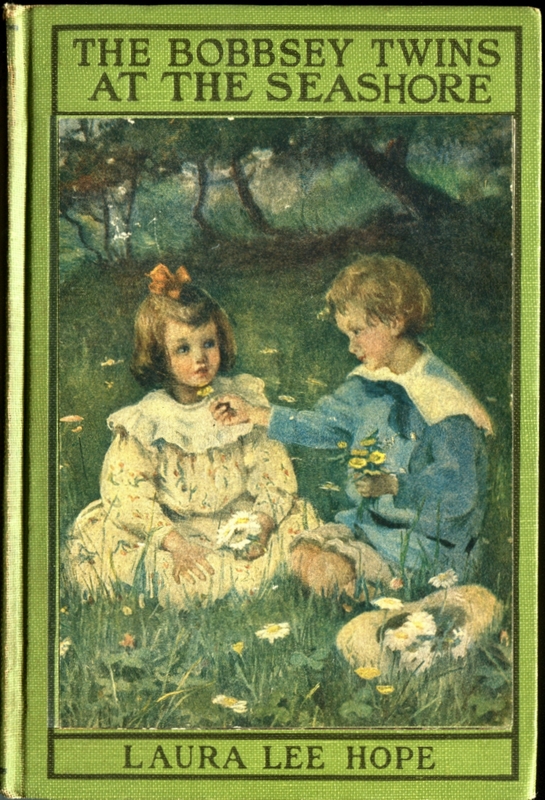 What I remember about the Bobbsey Twins is that my mother was philosophically opposed to them, but darned if I can remember why. That’s the most interesting comment I’ve read in a while. The only thing my mother didn’t like about the series was that the thought of having a twin was enticing to me, and I kept nagging for one. My mother spent weeks in the hospital after falls and breaking both her tibia and fibula. Surgery had to be delayed because of swelling, and then of course there was rehab. She was about 80 or so at the time, and things moved slowly. I still laugh when I remember that. It wasn’t a put-down of the younger set, exactly, but it certainly said something about the respect nurses like those in your photo were held. That’s a great story! I understand how authority and professionalism might be comforting to an anxious patient. Experienced nurses can probably anticipate or sense a patient’s state of mind and adjust their approach accordingly. Well, it was an error I should have caught easily at the time. I was simply too hasty. Fortunately, the newspaper clipping provided first names, so I can look for information about everyone in the photo. That could take a while! A dedicated group of young ladies, probably unaware of what they are about to deal with – WWII. Wow, your mum must have seen a lot! I sometimes come across British photo postcards taken at Voluntary Aid Detachments or Auxiliary Hospitals during the First World War, but rarely anything from later years. Photo postcards must have gone out of style in the 1930s. People would have sent snapshots tucked into letters instead. Do you have any photos of your mum in her nurse’s uniform? I’m curious what sort of photos were being taken of medical professionals in the UK at that time, if any. Yes, my Mum had to treat many broken ankles from parachutists, among other things. I think I have two photos of her in uniform, but just personal snaps. I do have all her nurse ‘badges’ though. How wonderful that you have those! I love how you added their names beneath their individual photo. I’m particularly inclined towards Hilda Petshot…the combination of her name and no bs expression is fantastic. Now that I have their first names, I’ve been doing a little digging on Ancestry to see what I could find. According to her Social Security Index, Hilda Petshot (1916-2001) was born in Pittsburgh and married twice during her life, or at least changed her name twice. In the 1930 Census, both of her parents are listed as having been born in Russia. However, “Russia” before 1917 could have referred to areas in Belarus, Ukraine, Lithuania or even Poland. Thanks for your comment, Zoe! I love the follow up! Thanks for posting.